This set of Concrete Technology Multiple Choice Questions & Answers (MCQs) focuses on “Mechanical Properties of Aggregates”. 1. What is A here? Explanation: According to Highway Construction and Maintenance, they prepared a graph of aggregates for stress vs strain in which stress is increasing wrt strain at first i.e. loading. 2. What is B here? 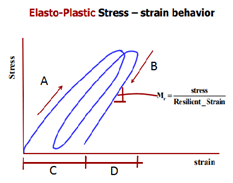 Explanation: According to Highway Construction and Maintenance, they prepared a graph of aggregates for stress vs strain in which stress is decreasing wrt strain after a period of time i.e. unloading. 3. From the graph below, what is C? Explanation: According to Highway Construction and Maintenance, they prepared a graph of aggregates for stress vs strain in which they came to a conclusion C is Permanent strain unrecovered. 4. From the graph below, what is D? 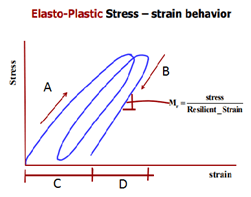 Explanation: According to Highway Construction and Maintenance, they prepared a graph of aggregates for stress vs strain, where D is resilient strain recovered. 5. Which machine is preferred for abrasion test? 6. A maximum value of ___ percent is allowed for WBM base course in Indian conditions. 9. The loss in weight should not exceed __ percent when tested with sodium sulphate and __ percent with magnesium sulphate solution.